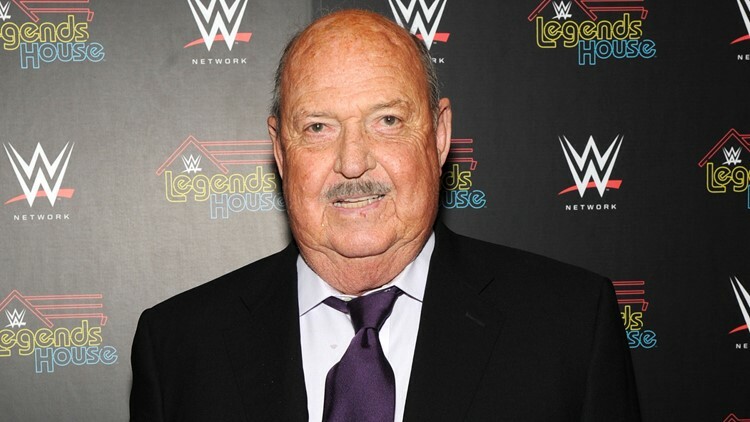 Cast member Gene Okerlund attends the WWE screening of 'Legends' House' at Smith &amp; Wollensky on April 15, 2014 in New York City. "Mean Gene" was considered one of the most recognizable interviewers in sports-entertainment history. WWE Hall of Famer Gene Okerlund has died at age 76, the WWE said in a statement on Wednesday. Considered the most recognizable interviewer in sports-entertainment history, "Mean Gene" rose to fame by speaking with major American Wrestling Association stars like Jesse Ventura, Bobby Heenan and Hulk Hogan. It was not immediately clear how Okerlund died, but TMZ reported he suffered health problems in years past and had two kidney transplants. I just saw Mean Gene in North Carolina at WrestleCade. It’s so true that our tomorrow’s are never guaranteed. Okerlund switched to WWE in 1984 and continued interviewing stars like Hogan and Randy Savage. He went on to host multiple shows, including "Prime Time Wrestling" and "All-American Wrestling." In 1993, he became the lead interviewer for World Championship Wrestling. "WWE extends its condolences to Okerlund’s family, friends and fans," the organization wrote in a statement. Okerlund also lent his voice to singing. He performed the National Anthem at the first WrestleMania in 1985. He went on to sing "Tutti Frutti" on a WWE wrestling album. He was a cast member on WWE Network's Legends' House.